I'm currently designing some prints in Illustrator. For example, I have a design on an artboard of 11 in x 14 in, 300 dpi and I can easily export it to jpeg/png. But I want to take this print and scale it to different other sizes (16 in x 20 in, 20 in x 30 in, 8 in x 10 in etc) and then export it. To accomplish this, I currently have an Illustrator template with artboards of different sizes. I copy the design and paste and re-scale it on all those artboards. But I don't think this is to efficient. Can you please let me know if there an easier way? I can use both Illustrator and Photoshop. You can place on illustrator file into another, just like you can with images. That way you can have a 'master' file with your design and a 'placement' file where the design is placed into artboards of various sizes for exporting. Then if you change one thing in your 'master' file, the 'placement' file will also be updated. The most universally useful way to handle any kind of print file would be to export as some kind of Vector file (.svg, .pdf, .eps, etc). This allows the file to be scaled to any size without losing quality. For example, you could take your 11" x 14" file, export as a vector and then print it at 11' x 14' and it will look as perfectly crisp as the smaller size. If the larger versions are proportional to the original you can scale them up right in the save for web dialogue when exporting..
You can also enter new height or width directly, like "16 in" and it will scale proportionally if the chain link thing is checked. As mentioned above, this works best with vector art. JPGs lose information every time they're saved (lossy) and look even worse when blown up. If you want to re-proportion you art (that's not scaling, it's re-sizing, and the examples in your question do not have the same proportion) then you usually have to re-arrange the elements to fit in the new rectangle shape. I don't know any automatic workflow to do this. If you don't care about proportion or distortion then uncheck the chain link thing and enter new values for height and width. The problem here is that your ouputs have a different aspect ratio. So the computer does not know what is a good fit for each of those. When should it crop and when not? If you have a new illustrator CC there is a the assets export panel. In essence you just drag the arwork to the panel and then specify any amount of exports you like. Its just nominaly geared toweards pixel size assets but there is no reason why you can not calculate the deired pixel amount yourself and be done with it. Or you can simply write a scipt to do this. Another alternative with more control is a rehash of Jeremy S. post. Instead of linking files make multiple artboards in your template file with symbols centered. Then when done you drop your arwtrk to the symbols palette and override the temporary symbol. Then export all artboards. Its a bit of work but its one time work. Adobe Illustrator: maximum artboard dimensions for PNG export? 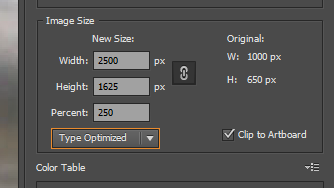 Is there a way to save the “Export As” Scale All Sizes in Photoshop CC?